The Gnostic Mass, or Liber XV, was the work of Aleister Crowley, written in 1913 as the central rite for the Ordo Templi Orientis. Modeled loosely after the Catholic Mass, Liber XV presents a narrative ritual filled with the tenets and imagery of the 93 Current, Thelema. It is a beautiful and uplifting rite, infused with a respect for truth through the marriage of science and religion. While not a member of the O.T.O., I have been a student of Crowley’s writings for decades now and have crossed paths with many who are intimately connected to the various roots and branches that spring from the Crowley tree. I’ve seen the Mass performed on several occasions, each slightly different from the other, but always with the erstwhile attempt by the participants to fulfill their roles to the best of their abilities, often with very mixed results. 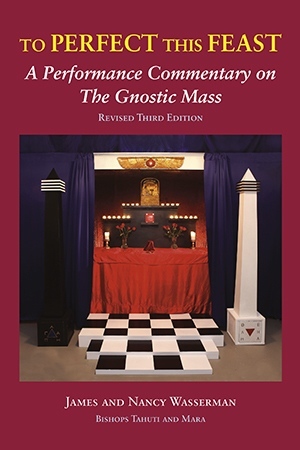 To Perfect This Feast: A Performance Commentary on The Gnostic Mass (Revised Third Addition) by Bishops Tahuti and Mara (James and Nancy Wasserman) is an impressive and erudite attempt to make the rite accessible by clearly defining not only the often confusing stage direction but also by illuminating the various energies at play. I consider it an invaluable resource, one that should be in the library of all students of esoterica. This smythe-sewn manual is a working text, built sturdy for hard wear and is a must for Thelemites. The insights found within, particularly concerning the complex choreography, is undeniably a godsend for all of us with a more than casual interest in magical ceremony. The paper is non-glossy, the type bold and easy to read. A scholarly work, to be sure, but put together with a craftsman’s sensibility. I cannot recommend this highly enough. To Perfect This Feast can be ordered direct from the publisher in a trade paperback edition or a beautiful hardcover collector’s edition. It is well worth the price of admission. This entry was posted on January 17, 2014 at 10:36 am and is filed under Archive. You can follow any responses to this entry through the RSS 2.0 feed. You can leave a response, or trackback from your own site.